The storm has passed, and it is time to survey the damage to your garden. How well have your plants and shrubs survived? With the right plant supports, you can carry out your inspection with confidence. Classic Garden Elements iron plant supports are built to withstand every weather, providing optimal protection for roses, hydrangeas, peonies and smaller shrubs. The extendable ‘Jean Vibert’ is a highly versatile model which can be used for supporting roses or attaching perennials, or even as a small wall trellis for climbing plants. 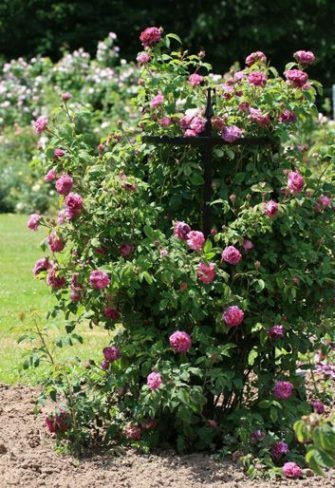 The ‘Rudolf Geschwind’ rose support is a sturdy one-piece welded construction ideal for wide-spreading shrub roses, peonies and mophead hydrangeas. 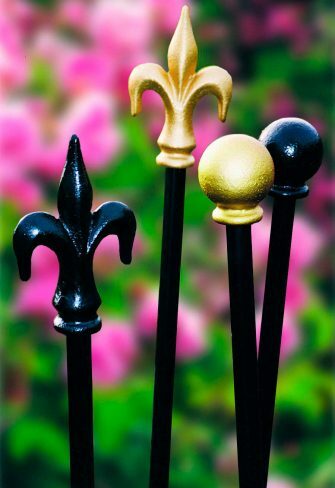 For tall standard roses we offer massive iron stakes with cast-iron Bourbon-lily or plain ball finials. They are the most stable product of their kind available on the market. Finally, our exclusive ‘Zurich’ border restraint with its stunning diamond latticework not only protects your plants, but also enhances the edging of beds and borders in well-structured gardens. For climbing roses, the perfect supports are arches and wall trellises. 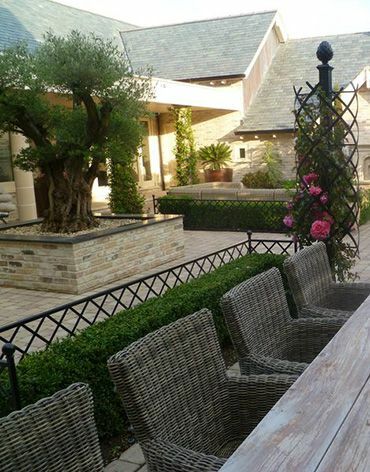 High obelisks, pillars and pyramids are also very suitable – and a beautifully effective way of displaying your climbers. Shrub roses with thinner shoots and large heavy blooms will generally need to be trained from the time they are planted. They will benefit enormously if allowed to spread out along a metal frame. This will make them wider and more stable and help them to grow into an attractive round shape. The ring-shaped ‘Jean Vibert’ and ‘Rudolf Geschwind’ rose supports are ideal for this purpose. They are available with a diameter of 55 or 40 centimetres and in correspondingly different heights. The art of staking – attaching young plants to some form of support – has long been one of the essential tasks of every gardener. There is wide range of supports available, both wood and iron. A stake is the ideal choice for places where a light wind can quickly turn into a hefty gust. 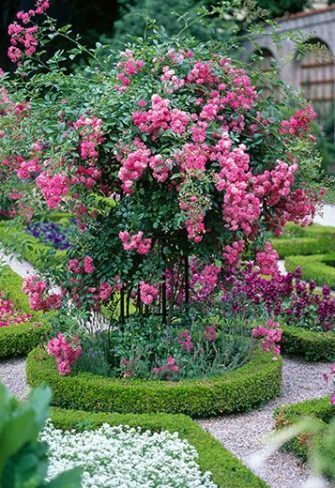 In summer, when tall standard roses are covered in blooms, it will ensure that they keep their balance. Wooden stakes are sometimes used for this purpose, though their stark rustic appearance clashes somewhat with the polish of the noble beauties that surround them. A considerably more elegant match for tender, scented blossoms is a stake of massive iron. Classic Garden Elements has created the ideal stake for standard roses. Made of massive, hot-dip galvanised iron, it brings together function and form in perfect harmony. With its clever anchoring system, it will also provide additional stability in places exposed to especially strong winds. Garden Edgings accentuate a Garden’s style. A picture frame, whether made of wood or metal, affects the impact a photo or painting has on us. Similarly, border restraints can influence the way we see a garden. Border restraints serve to structure garden space clearly by separating drives, paths and lawns from flowerbeds and borders. Ideally, border restraints should be made of a material that matches the style of the garden and also goes well with the plants. The attractive medium-high ‘Zurich’ border restraint is made of hot-dip galvanised and powder-coated steel, the perfect complement to a stunning border of prize roses. With clear lines and understated refinement, it frames and tames the luxuriance of nature in a most elegant fashion. On a practical level, it prevents roses or other flowers from spreading out onto the lawn or garden paths, making access easier whenever you wish to gather flowers for a bouquet or to cut off dead blooms. The ‘Zurich’ border restraint can be custom-made to your measurements. If you require any help when designing your rose garden, we would be delighted to advise on the best choice of plant support.